Located smack dab in the middle of America’s Heartland, Iowa is probably better known for its thriving livestock industry than for real money legal poker and gambling. But make no mistake, Iowans love the betting action. So much so, that IA state officials have legalized all five forms of live real-money gambling wagering, including lawful real cash poker games like Texas Hold’em. That said, Iowa has yet to pass legislation that would legalize Internet poker and casino gambling. But it looks like even the legit poker website situation is about to change, not this year but next. Until then, residents of IA, the Hawkeye State, have the state’s nearly 20 commercial and tribal casinos and real money poker gambling rooms to keep them busy at betting. You’ll be happy to know that Hawkeye State gamblers can sign up for any of our real money US poker sites. 3 Can Players from Iowa Play Online Poker? 4 Is Online Poker Legal in Iowa? In early-2014, the President and CEO of the Iowa Gaming Association  announced that Iowa lawmakers would not pass an iGaming and Internet poker bill in 2014. Instead, they’re committed to studying the growth of existing real cash iGaming Internet poker gambling markets, such as those in New Jersey and Nevada . Once the IA gambling lawmakers feel they’ve gotten a better handle on what works and what doesn’t in relation to real money poker websites, Iowa’s state officials should be more aptly prepared to decide on the language of a future Internet poker betting bill. Or at least that’s the plan. Presumably, the next iteration of the legal Internet poker bill will be brought before Iowa legislators in 2015. We say next iteration because it will be the third time state officials have considered the idea of a regulated real money online poker in IA. In 2012, an Internet gaming and poker website bill relating to real cash gambling and betting was passed by the State Senate 29-20, yet failed to reach the House in time for consideration . The next year, a second Internet poker bill sponsored by State Senator Jeff Danielson (D-Cedar Rapids) fell in a subcommittee, only weeks after receiving preliminary approval. So, it was goodbye to betting real money at legit poker websites for Iowa residents after all. Can Players from Iowa Play Online Poker? Alright, so online poker isn’t regulated in Iowa yet because the IA lawmakers haven’t made up their minds on Internet poker real cash betting yet. But don’t let that get you down. You can still play real money poker on any of the US friendly poker websites, they are all welcoming players from Iowa looking to bet on games like Texas Hold’em poker. The biggest problem they face is choosing which Internet poker network to try out first. Other states’ residents, Kentucky’s for one, do not have it as easy as IA citizens when it comes to registering an account on an offshore real cash poker website, but Iowans are among those who should have no problem creating a username on Internet poker websites, depositing funds to play poker for real money and finding a juicy real cash game or multi-table poker website tournament for betting in. Is Online Poker Legal in Iowa? Unsurprisingly, Iowa’s gambling and betting statues make no mention of online poker or Internet poker websites IA residents can access from their computers. The Internet is mentioned once, but it’s in relation to the lottery and not real money poker gambling. It follows that the legality of online poker websites falls into a murky, gray area. So instead of trying to provide you with a black and white answer about whether real cash Internet poker is legal in Iowa, we’ve highlighted key facets of the gambling law that could pertain to online poker and playing for real money at Internet poker websites. Read them, remember them, and if you have any additional questions seek the counsel of a legal professional well versed in gambling and betting laws in IA. Based on the deliberately vague definition of gambling, it appears that Iowa’s laws make no differentiation between skill and chance games. That bodes poorly for offline and Internet poker. Fourth-degree gambling (less than $100): First offense is a serious misdemeanor, with subsequent offenders receiving an aggravated misdemeanor followed by a class “D” felony. 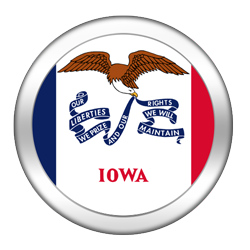 Fourth time offenders in Iowa are pegged with a class “C” felony charge. Third-degree gambling (between $100 and $500): First timers are slapped with an aggravated misdemeanor. Violate the law three or more times in IA and expect a class “C” felony charge. Second-degree gambling (between $500 and $5,000): Expect a class “D” felony charge the first time around, and a class “C” felony if caught gambling again. First-degree gambling (over $5,000): Automatic class “C” felony charge. Possessing a gambling or betting device is deemed a serious misdemeanor, as is pool selling. It’s in a way ironic that most pro-gambling states are extremely intolerant of illegal gambling and real money poker activities. But in a way it makes sense. Iowa’s regulated gambling industry is a huge source of state tax revenue and legal real cash poker helps support the IA state. The last thing Iowa needs is for underground gambling halls and unregulated Texas Hold’em poker betting rings to steal its patrons. To read more about Iowa’s gambling and Internet poker laws, check out the Iowa Racing and Gaming Commission website . For the longest time, Iowa’s gambling and betting scene remained relatively quiet. Then, in 1983 the poker gambling and real money betting scene in IA suddenly sprung to life, setting off a domino effect that would see several forms of gambling legalized in the next decade, including legal real cash poker. That year, the Pari-Mutuel Wagering Act was passed and the Iowa Racing and Gaming Commission was established. Dog and horse racing gambling facilities opened that year, and real cash betting via simulcasting was added in 1989. It was also in 1989 that voters in eight Iowa counties approved riverboat gambling and real money poker referendums. The first riverboat casino and lawful poker room would open two years later, and in 1992 two additional counties approved a referendum. Legislation legalizing a statewide Iowa lottery was made law in early 1985, with sales for real money betting tickets beginning shortly after. Since, the lottery has raised nearly $1.3 billion dollars for state related programs with the profits from Iowa residents’ gambling . In 1992 the government forged a poker and gambling compact with the state’s Indian factions to allow tribal gaming. Three tribal casinos opened that year. Land-based casinos and legit real money poker rooms would soon follow. All told, from 1992 to 2000 a staggering 12 casinos and lawful poker gambling destinations opened their doors to the public. Online poker entered the picture in 2011 and Internet poker truly hit IA. That year, the Iowa Racing and Gaming Commission prepared a report on state regulated Internet poker websites. The report revealed that the state could generate anywhere between $3 and $13 million in tax revenue annually off legit real money online poker websites alone. IA State’s first attempt to legalize real cash online poker websites came in early 2012, but eventually died in the House. A second attempt to bring in lawful Internet poker in 2013 failed to make it out of a Senate subcommittee. Of the 50 US states, exactly three permit all five forms of regulated gambling. Iowa is one of them. And while there is no dedicated casino strip like there is in New Jersey and Nevada, Iowans have a broader set of gambling options than nearly anyone residing in the US. US online poker players are enjoying the game at various Internet-based poker rooms while the state has no official policy on such rooms. Right now, quarrels over intrastate real money Internet poker revenues and lackluster support from voters are preventing IA real cash poker legislators from taking a more aggressive stance on real money poker websites. But now that the initial Internet poker revenue reports are coming in from states that have already legalized iGaming and already have lawful poker websites, Iowa’s authorities are seeing a clearer picture of how a potential Internet gambling market would perform in IA. There are still some minor details to work out, but it wouldn’t be unsurprising to see Iowa pass a real cash iGaming Internet poker bill in 2015. In October 2013, Tim Giardina, the second in command officer of all US nuclear weapons, was suspected of using $1,500 worth of counterfeit real money poker chips at the Horseshoe Council Bluffs casino and real cash poker room in Iowa . Although the Iowa state did not press charges, Giardina was suspended and demoted to a two-star admiral thanks to his adventures into not very legal Texas Hold’em poker betting. In a 2013 survey, it was revealed that only 23% of Iowans are in favor of online poker websites . That sounds bad, but considering that the majority of citizens in most states aren’t gamblers, it could mean that up to nearly a quarter of Iowans will register for a real money poker account at online poker websites. Wishful thinking on the part of real cash poker gambling fans, but just like in the game of legal poker itself, anything is possible. Otherwise, look for Iowa to take a calculated wait and see approach to online poker websites much like some other states have done because they’re not sure how lawful Internet poker will work out for those states that have already made real cash poker gambling websites legal. The prospect of an interstate Internet poker compact with say, Illinois, would really speed things along and bring IA gambling fans real cash poker action quicker, as Iowa’s population of slightly fewer than 3.1 million is paltry in comparison to most other state’s considering iGaming and Internet poker. Illinois, by comparison, boasts nearly 13 million residents which would add a significant amount of real money revenue into any poker website prize pool. In either case, it’s hard to imagine that a state like Iowa that has legalized all forms of gambling, including legal real money poker, and relies heavily on tax revenue generated from gambling and betting related activities would not be among the first to pass an iGaming Internet poker bill. We’ll just have to wait and see when the first Iowa real money legal poker website hits the Internet!